Pedestrian safety improvements were provided for Centennial Elementary School, Flowing Wells Junior High School, and other public facilities. 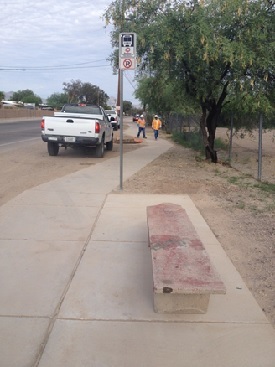 Improvements included construction of 2,250 feet of 5-foot wide sidewalks and ramps on the north and south sides of Wetmore Road from Romero Road to La Cholla Boulevard and 770 feet of sidewalks on the east side of La Cholla Boulevard from Wetmore Road to West Hadley Street. Right turn lanes were added for eastbound Wetmore Road to southbound La Cholla Blvd. and for northbound La Cholla Blvd to eastbound Wetmore. A left turn lane was added for northbound La Cholla Blvd to westbound Wetmore Road. ADA compliant ramps were added throughout the project footprint and through-traffic movement on northbound La Cholla Blvd was re-aligned at the Wetmore intersection.